Click here to view the exhibition on Google Arts and Culture. James hd Brown: Life and Work in Mexico is part of Pacific Standard Time: LA/LA, a far-reaching and ambitious exploration of Latin American and Latino art in dialogue with Los Angeles, taking place from September 2017 through January 2018 at more than 70 cultural institutions across Southern California. Born in 1951 in Glendale, CA, James hd Brown relocated with his family to Oaxaca, Mexico in 1995 where he founded Carpe Diem Press. 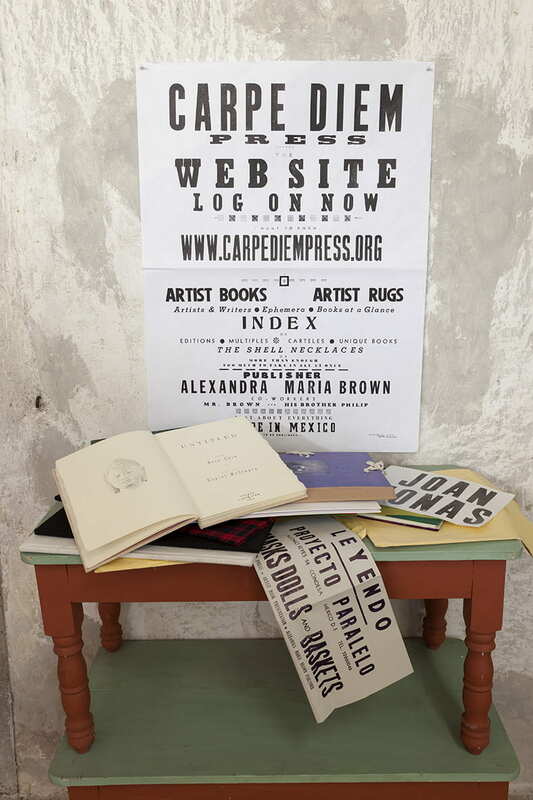 James and his wife Alexandra Maria Brown created the Carpe Diem Press in 2000. Carpe Diem is a potent example of cultural dialogue and continues to be one of the proofs of the Browns’ contribution to the new creative environment in Oaxaca. In thorough collaboration with Gabriel and Judith Quintas of Linotípográfica Quintas, Carpe Diem produces limited edition artist books. The books feature the work of influential artists and writers from the United States and Mexico. The USC Fisher Museum of Art highlights Browns’ unique artist press, featuring thirteen books and related ephemera. Some of the artists included in the series are Graciela Iturbide, Joan Jonas, Kiki Smith, Dr. Lakra, Jack Pierson and Dan McCleary. Brown has produced a new book with Graciela Iturbide and Dr. Lakra especially for Pacific Standard Time: LA/LA. The Carpe Diem Press offers PST: LA/LA a direct and comprehensive manifestation of the critical impact and dialogical encounter in Mexico that Brown has had. These books form a unique legacy witnessing how Mexico infiltrated Brown’s creativity. The books, archives and ephemera associated with Brown, which are included in Fisher Museum’s exhibition, challenge our very thinking about the possibilities and definition of fine art, about the possibilities and limits of artisanship and craft, about the nature of the artist book itself, and finally, about the indispensability of generosity when artisans and the artists work together. Brown’s exhibition also features his “My Other House” series, begun in 2009 and worked on continuously since then. The idea for this project came to Brown after his two sons, while living “in a forgotten house in the wildness of Mexico, somewhere outside of Oaxaca” discovered a staircase leading to an “almost secret” mezzanine. Nobody else was allowed access to this place, a sanctuary that the boys called “my other house”. “My Other House” is a metaphor for that imaginative space essential to living a creative life. USC Fisher Museum of Art is the only Pacific Standard Time: LA/LA partner featuring an exhibition dedicated to an LA-born expatriate artist. Brown has lived and worked in Mexico for the past 22 years, and Fisher’s exhibition will demonstrate his ongoing creative dialogue and exchange with Mexican art, artists, and culture. 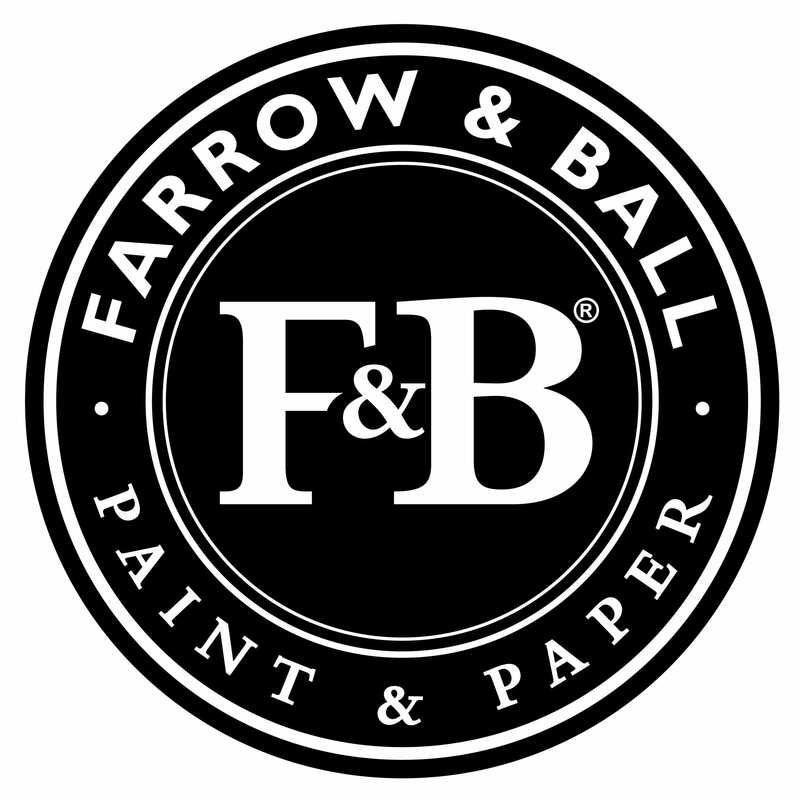 USC Fisher Museum of Art thanks Farrow & Ball for supporting James hd Brown: Life and Work in Mexico with their generous contribution of paint, used as an essential design element for the “Carpe Diem Press” section of the exhibition. 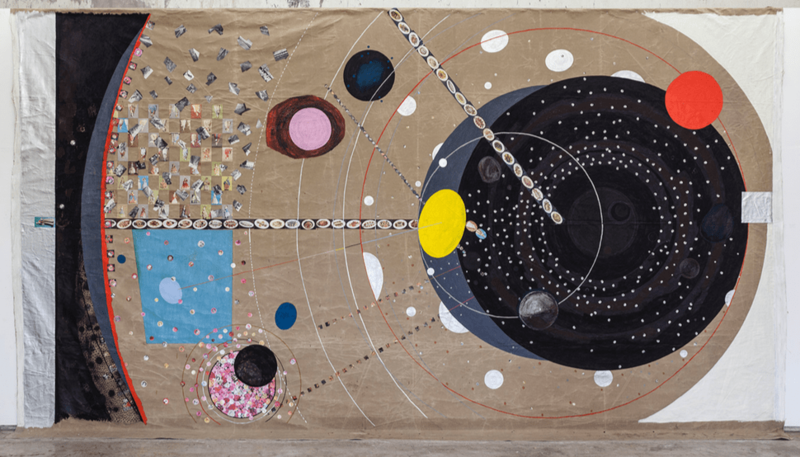 James hd Brown, Mystery of My Other House, 2014, Oil, pencil, collage and industrial paint on linen, 138 x 262 inches, Collection of the artist. James hd Brown & Alexandra Maria Brown, The Carpe Diem Press, Oaxaca, Mexico. A Selection of Artist Books and Posters, 2016, Collection Carpe Diem Press.